NEWTOWN HAS BEEN A CONSTRUCTION SITE FOR THE LAST FIVE YEARS, DURING WHICH TIME IT WAS RUMORED (AMONGST CONSTRUCTION WORKERS) TO BOAST THE LARGEST HOLE IN THE GROUND SINCE CONSTRUCTION OF THE CARLTON CENTRE! CRANES, DIGGERS, NOISE AND DUST ARE NOW (AT LAST) STARTING TO BE REPLACED WITH A BUNCH OF NEW BUILDINGS – AND PERHAPS MORE IMPORTANTLY, THE SIGHTS AND SOUNDS OF DOWNTOWN JOBURGERS SHOPPING, EATING, WORKING AND PLAYING. WITH A CITY LODGE NEARING COMPLETION, THE LATEST PIECE TO BE ADDED TO THE NEWTOWN PUZZLE IS THE NEW LAAGER THEATRE, RECENTLY RE-OPENED BY JOHANNESBURG’S LEGENDARY MARKET THEATRE. HISTORICALLY THE SMALLEST OF THE MARKET’S THREE THEATRES, THE LAAGER HAS ALWAYS BEEN AFFECTIONATELY KNOWN AS THE SMALLER, SLIGHTLY TATTY ‘EXPERIMENTAL’ SIBLING OF THE LARGER, MORE FORMAL BARNEY SIMON AND JOHN KANI THEATRES. THE BRIEF FOR THIS NEW THEATRE AIMED TO CELEBRATE THIS FACT AS AN IMPORTANT DESIGN CONSIDERATION. THE SCRAPPY 1980’S STRUCTURE, CARELESSLY SLAPPED ONTO MUSEUM AFRICA’S HISTORIC FACADES (HACKING BACK THE ORIGINAL ROOF LINE AND SMOTHERING THE OLD BRICKWORK AND WINDOWS) WAS TORN DOWN TO MAKE WAY FOR A NEWER, MORE FLEXIBLE SPACE, WHILST STILL ATTEMPTING TO RETAIN THE ‘UNPOLISHED CHARM’ THAT THEATRE PATRONS HAD COME TO LOVE. THE LAAGER THEATRE COMPLEX COMPRISES A THEATRE (SEATING UP TO 180 PATRONS) A PUBLIC LOBBY AND TWO ‘BACK OF HOUSE’ WINGS (ACCOMMODATING DRESSING ROOMS, GREEN ROOMS, ACTOR’S BATHROOMS AND OFFICES) – ONE FOR THE JOHN KANI THEATRE AND ONE FOR THE LAAGER THEATRE. THE COMPLEX CLIPS NEATLY ONTO THE SIDE OF THE EXISTING MARKET THEATRE/MUSEUM AFRICA BUILDING, FACING NORTHWARDS TOWARDS THE NEWTOWN JUNCTION DEVELOPMENT. THE NEW THEATRE STRUCTURE IS A RAW OFF-SHUTTER CONCRETE ‘BOX’ WHICH, DEPENDING ON THE DESIGN OF THE PERFORMANCE, PERMITS MULTIPLE OPTIONS FOR STAGE & SEATING CONFIGURATION – FROM TRADITIONAL END-ON, TO THRUST AND EVEN CATWALK FORMATION. WITH THE THEATRE ‘BOX’ PULLED AWAY FROM THE HISTORIC FACADES, THE NEW LOBBY SPACE FORMED IN-BETWEEN IS ENTERED EITHER THROUGH THE MAIN ENTRANCE OF THE MARKET THEATRE, OR FROM THE NEWLY-OPENED ‘POTATO SHED‘ EATERY LOCATED UNDER THE FULLY RESTORED HISTORIC STRUCTURE OF THE SAME NAME. EITHER WAY, THE PECULIAR VOLUMES CREATED BETWEEN OLD AND NEW IS A SPATIAL SURPRISE, FURTHER EMPHASIZED BY THE PLAYFULLY-COLOURED INTERIOR RED LIGHTING. BUT THROUGH THIS WHIMSY, THE BUILDING IS ALSO ABOUT A PROFOUND ARCHITECTURAL RESPECT, WHICH IS AN IDEA THAT MRA NURTURES IN MOSTLY EVERYTHING THEY DO… TO BREATHE NEW LIFE INTO AN OLDER STRUCTURE, TO STEP BACK AND REMIND OURSELVES OF ITS WORTH IN JOHANNESBURG’S BROADER NARRATIVE. THE LAAGER THEATRE IS ONE OF SEVERAL NEWTOWN BUILDING PROJECTS IN WHICH MASHABANE ROSE ASSOCIATES HAVE BEEN INVOLVED. 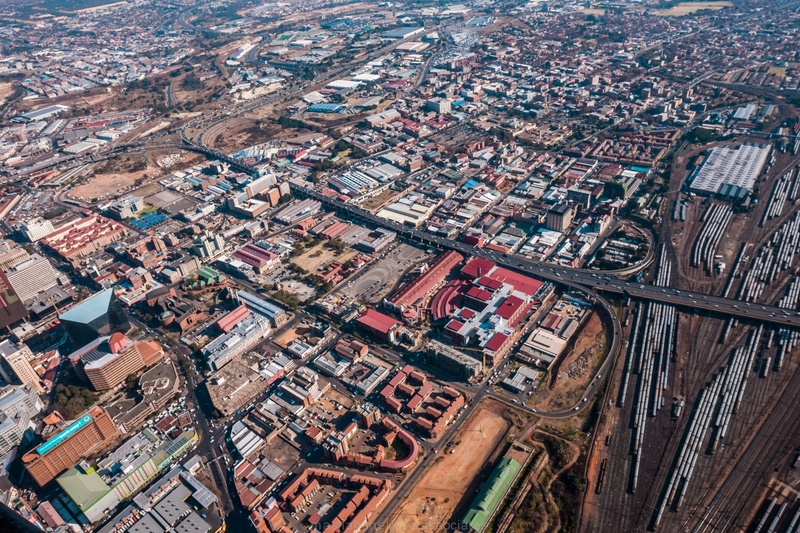 IT IS FLANKED BY NEWTOWN JUNCTION, A LARGE MIXED-USE DEVELOPMENT COMPRISED OF MUCH-NEEDED RETAIL AND COMMERCIAL SPACE AND THE MAJESTIC, A FIVE-STOREY COMMERCIAL BUILDING, LEASED BY NEDBANK. THE RESTORED STEEL PEDESTRIAN BRIDGE IS ONCE MORE OPEN TO THE PUBLIC, AND PROVIDES ACCESS FROM THE VIBEY, NEWLY-OPENED EATERY ‘THE POTATO SHED’ TO THE UPPER LEVEL LOBBY OF THE MARKET THEATRE. THIS MEANS THAT PATRONS CAN PARK THEIR CARS SECURELY IN THE BASEMENT OF NEWTOWN JUNCTION, EMERGE INTO THE LARGE OPEN SQUARE, HAVE DINNER, WALK OVER THE BRIDGE AND WATCH A SHOW.